It’s always a dilemma when you want to spend an evening eating in Central. Where can you find a quality meal at a reasonable price? It’s no secret that rent is sky-high around Lan Kwai Fong and that no doubt affects the cost of a decent dining experience. Well, Ore-no Kappou by Ginza Okamoto has been sent to LKF from Japan to solve this problem. And solve it as one of the first eateries at the new California Tower to boot. The Ore-no family is massive in Japan. There are tons of restaurants, primarily in Tokyo, that focus on fine ingredients but offer them up at excellent prices. There’s even Ginza Okamoto, which has held two Michelin stars for the past three years and owns the record for getting those stars so quickly – just five months after opening in 2012. So when Ore-no Kappou in Hong Kong was announced as the group’s first ‘Michelin for the masses’ foray to foreign shores, bringing with it the Ginza Okamoto name and also having executive chef Hidetsugu Okamoto involved, we were more than excited. Kappou wants to serve quality food at excellent prices – and fast. With only standing tables at the Japanese restaurants, the setup allows for more customer capacity. Diners also finish their food fast, allowing for a high turnover. It’s a winning formula. Okay, only a third of the tables in the Hong Kong venue are standing but the concept has arrived. 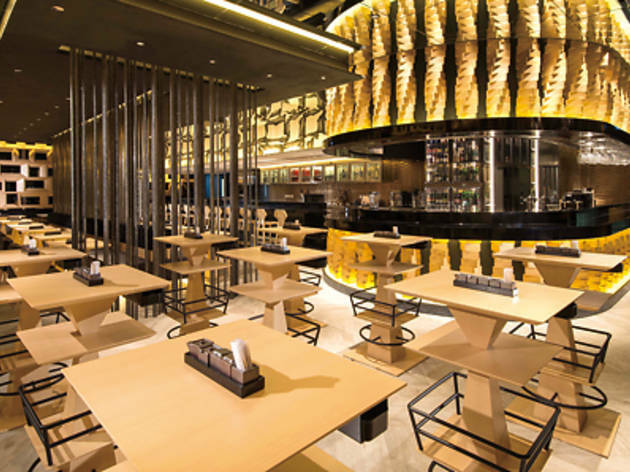 The food at Kappou focuses on both contemporary and traditional Japanese dishes, mostly with a twist, and, as we enter, we find the interiors to be smart and chic, with mirrored ceilings creating the illusion of high walls. 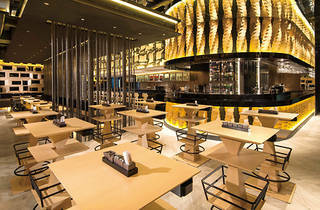 There are also vertical wooden partitions that separate the seated and standing tables. The wall decals are creative with whitewood fixtures that give off a contemporary ambience. However, when we’re shown to our seats, it’s a tight fit. We almost knock elbows with our fellow diners. And then we’re given three menus, which cover our particularly small table and make space a real premium here. There’s a normal one with cold and hot dishes, one for monthly specials and a then a two-Michelin star chef menu. Okay, this restaurant is yet to earn any stars but it is borrowing dishes from the record-breaker over in Tokyo. We manage to keep our menus on the table despite being crammed in and we order from all three, starting off with the karasumi soba ($80). It’s a good kick-off. The cold noodles are well seasoned and come with mullet roe dust that’s full of flavour without being overly fishy. Our other cold starter is srinagashi ($80), a potato gazpacho containing morsels of seared seafood. We like this dish for its tender bites. For our mains we plump for the awabi houshoyaki ($280), a medley of abalone, sea urchins, scallops and kelp cooked inside a paper bag. The flavours of the ingredients are sweet and expertly layered so that each bite contains an element of all them. We marvel at the good price we’re paying for this dish. Another Michelin-starred recommendation is the kamo negiyaki sansho sauce ($120) – grilled duck breast with a Japanese pepper sauce that has lemony notes and leaves the palate tingling. This dish is definitely worth the stars. Last to arrive is the buri shabu shabu ($280), a yellowtail fish hotpot that’s served on a portable gas stove that’s almost wider than the table. And this is where chaos suddenly ensues. We quickly scoop what’s left of the duck and abalone on to our plates so the staff have enough room to put the stove down and then, just as we start cooking our fish, the chef Taku special curry ($70) arrives and, with no room on the table, the waiters portion the rice on to small plates for us. It all leaves us feeling rushed, which is a shame as the curry has a distinctly bitter flavour that is unique and is a bargain at that price. But, in our desperation to make space, it gets lost in the mix alongside the shabu, which does boast superior ingredients but lacks a wow factor. Eventually the table is cleared to make way for dessert – the pineapple crème brûlée ($60). This is where those Michelin-starred Ginza Okamoto skills really shine through. The brûlée sits in a hollowed-out horizontally-sliced pineapple, allowing for the sharp fruit flavours to seep into the dessert without the enzymes interfering with the coagulation of the egg. Culinary genius. And extremely tasty. Ore-no Kappou 6/F, California Twr, 32 D’Aguilar St, Central, 2328 3302; facebook.com/orenohongkong.